We invite you to inspect our beautiful range of “Ferrina” shoes made in England by British craftsmen under the supervision of Signor Salvatore Ferragamo, of Florence. 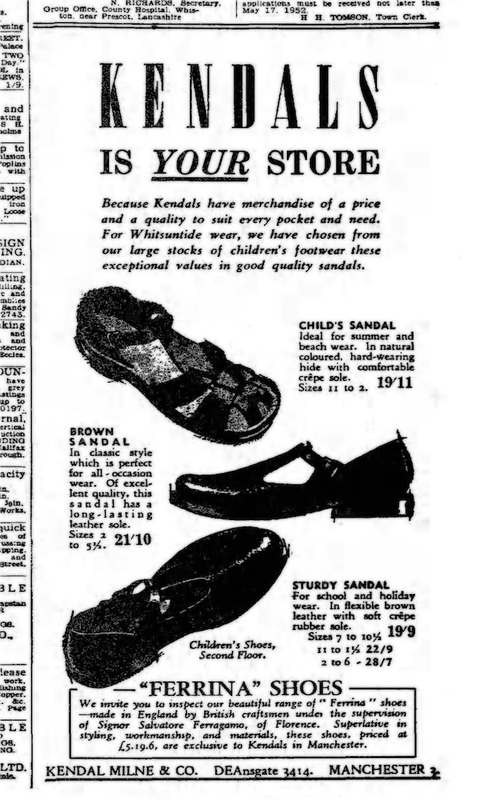 Superlative in stylings, workmanship, and materials, these shoes priced £5.19.6 are exclusive to Kendals in Manchester. 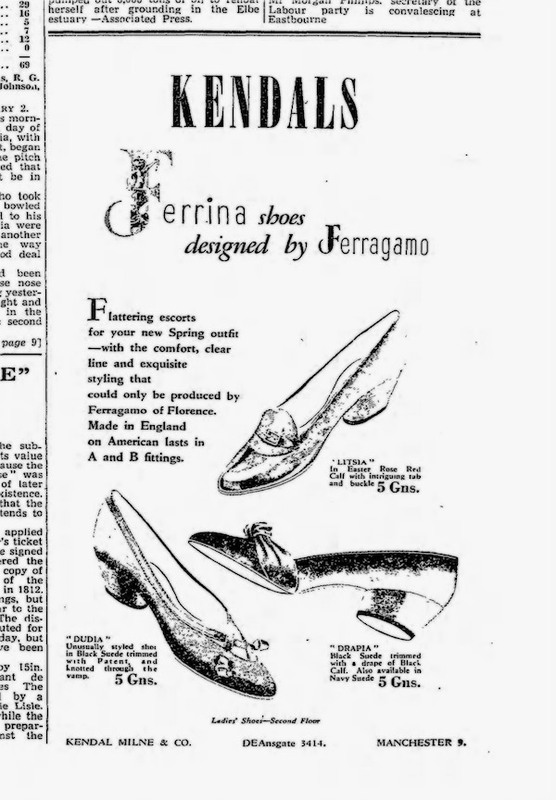 The ad above is deceptive: the Ferrinas weren’t shown although Ferragamo also produced children’s footwear under the new moniker. No stone left unturned. HAND MADE SHOES BECOME AVAILABLE TO AVERAGE PEOPLE. In New York I visited the showroom where samples of the Ferragamo shoe fashions, soon to be available at Joseph Horne’s, were shown to me. In sizes 4 1/2 to 10, AAAA to C widths, there were so-called standard shoes, delicate looking, sturdily made, beautifully turned and stitched. With moderately high but extremely graceful heels that look higher, two closed-toe, closed-heel shoes had a single eyelet tie, or were made in a décolleté pump style with slightly rounded toe. A black suede pump had a gold underlay. This was in the specially styled group, which also included shoes in four or five shades of leather given an iridescent quality through some secret gold wash process. 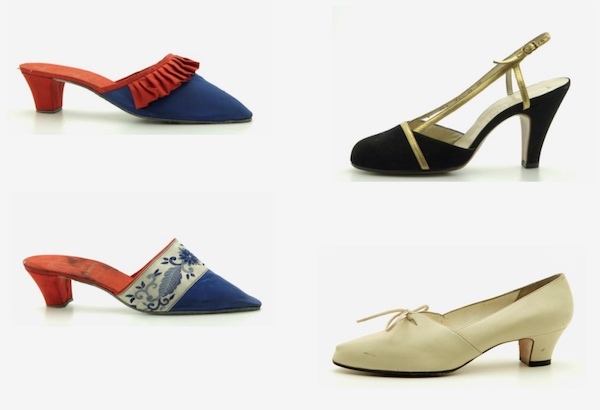 Salvatore Ferragamo kept producing hand-made shoes until his death (1960); probably the hand-made production survived his creator for a few years. 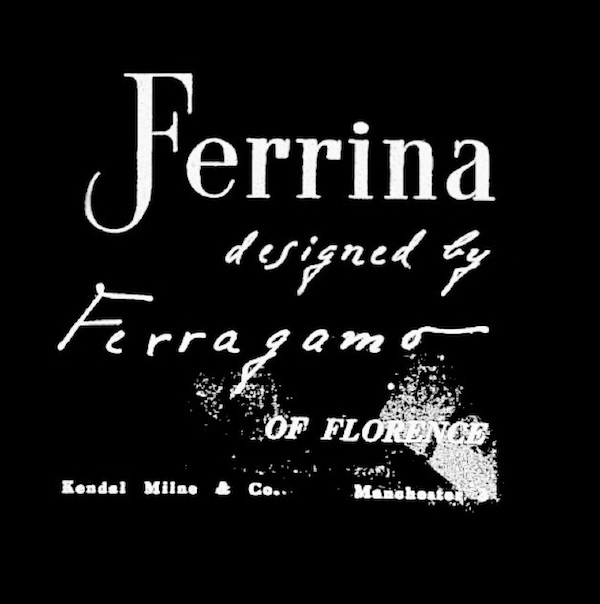 All the same, while it is unclear when the Ferrina brand ended its course, the established M.O. remained in place. The market demanded it and there was no looking back.